The Temple of Heaven or Tian Tan is located about 2km southeast of the Forbidden City (Beijing). , It was founded in the first half of the 15th century, is a dignified complex of fine cult buildings set in gardens and surrounded by historic pine woods. As Chinese emperors called themselves Tianzi, or the son of Heaven, they had to cede supremacy to the heaven in terms of abiding. In the days of the Empire the Tiantan Temple Complex was a sacred site where the Emperor would perform Buddhist rituals and rites , meditate and pray to Heaven. The temple plus subsidiary buildings and a surrounding garden covers an area five times the size of the Forbidden City. 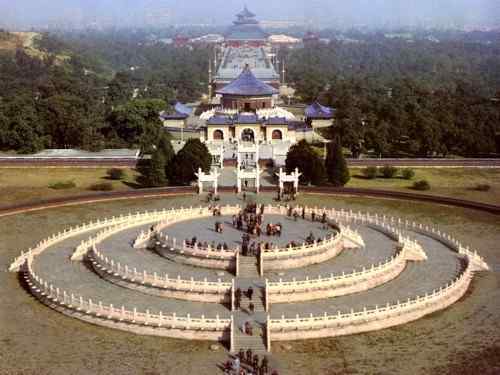 The best-known are the Temple of Heaven in the south, the Temple of Earth in the north, the Temple of Sun in the east, and the Temple of the Moon in the west. The Temple of Heaven is the grandest of them all.